Lamb dressed as Mutton: Halloween! I don't actually really celebrate Halloween, and this year we didn't even do pumpkins :( Because it is mid week and we have lectures tomorrow, no one went out. 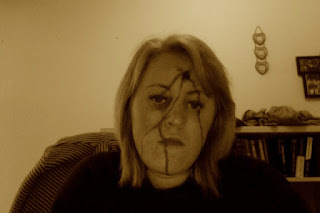 This didn't stop me from putting on Halloween make-up on though (it may have had something to do with the essay I was supposed to do) to look like I was shot. What d'you think? As I said we weren't going out and my housemates demanded that I made us all some treats so that we could at least pretend we were taking part. Originally I was just going to buy some over-priced Halloween chocolate BUT THEN I saw these really cool brownies on Teenage Granny's blog that I just had to make them (by the way, her blog is AMAZING you should really check it out). The idea of using brownie mix was quite upsetting, but in the end they were so quick it actually didn't matter! You can get the "recipe" off her blog and I know it's a bit late, but just pretend that Halloween has a boxing day and bring them out tomorrow. Here are the ones I made, hastily this evening. Cool eh? Shame I don't like brownies or marshmallows!! Hope you had fun wherever you are, especially if you dressed up and went trick or treating. I changed the blog again today (this also may have had something to do with said essay), what do you think?